Please read that quote once or twice more. What is the part of that quote that really seems to jump off the page? If you answered ‘all people provide value in your life’, you’re correct. This quote simply means that your mindset and attitude are the key elements of feeling fulfilled in your experiences and relationships – not material possessions. You cannot and will not thrive and be fulfilled unless your mind and heart are in balance. Look no further than Hollywood, California for evidence of this. There are more miserable, wealthy people in that city than anywhere else in the world. Why? While they have plenty of money and possessions, they are neither abundant nor fulfilled. They are not truly abundant in their minds and hearts. Again, thriving is something to be tuned into through our minds and hearts, not acquired through material possessions. As such, you cannot thrive in your life when there are certain negative forces working against you. If you happen to be experiencing any of these forces, don’t blame yourself! We are human beings…complex creatures with complex ways of thinking and feeling. Just make a conscious effort to improve your situation. Here are 5 things that may be keeping you from Thriving. According to an article by Psychology Today titled “The Psychology of Scarcity,” Dr. Melanie Greenberg attests that a scarcity mindset shortens and narrows your time frame, resulting in impulsive, short-term decision making that increases difficulties in the long term. An example of this include making excuses for not paying off debt (such as a credit card) while acting impulsively (putting something expensive on that credit card that you refuse to pay off). Dr. Greenburg recommends 5 ways to overcome a scarcity mindset without becoming complacent – practicing gratitude (being thankful for what you have), not comparing yourself with others (you replace envy with gratitude), stopping obsessive thinking (such as anything wrong you may have done), taking preemptive measures (preparing a budget, buying healthy food to avoid temptation), and not being greedy (helping others leads to more for you). We are all susceptible to negative thoughts and feelings about ourselves. Perhaps you’ve even experienced a bout with depression or some other psychological trauma. Psychologists routinely associate a depressed mindset with feelings of worthlessness and inadequacy. Feeling worthless, by definition, is the textbook opposite of feeling abundant. You cannot and will not have an abundant mindset if you feel this way. Feelings of worthlessness can take many different forms, mostly in thoughts or feelings of being deficient in achievement, attractiveness, intelligence, health, or other negative views towards yourself. Here’s the thing to remember: you are worth an immeasurable amount, especially to the people who love and care about you. This being the case, it is impossible to be worthless…even if you don’t particularly care for yourself at times. Dr. Aaron Beck, recognized as the father of modern Cognitive Therapy, recommends refusing to buy into your own sense of worthlessness. More specifically, Dr. Beck details three ways in which you can combat these feelings – monitoring your self-critical dialogue, writing these thoughts as they arise (10-15 minutes each day), and learning to “cope instead of mope” by understanding these thoughts without judgment – just observe your thoughts and watch them disappear. Not judging these feelings results in less depressive thoughts, giving you the ability to lead a life of abundance and positivity. Here is a fact: we all have faults. Nobody is perfect. You are not perfect, nor are the people that you are close with. Unfortunately, you also happen to live in a society that often values status and achievement more than morality and righteousness. As such, people that have not attained “prestige” or “success” are often looked down upon. This goes for people who are “unattractive”, “weird”, or any other negative, vague term you can think of to describe someone. Judging and blaming someone is just another form of negativity disguised to make you feel better about yourself. However, not only do you harm yourself, you accomplish absolutely nothing. Actually, it does “accomplish” something – it breeds more negative feelings towards others and yourself! 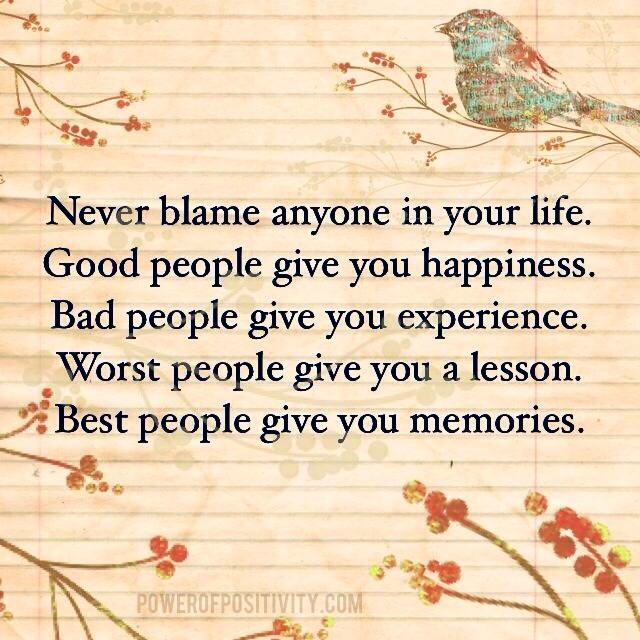 Everyone in your life is there for a reason. By bringing harm to yourself, you keep yourself from thinking abundantly. Whenever you find yourself judging someone, just smile and say hello instead. Odds are, they are good people who will do the same right back. Now you’re back on track to your fulfilling and abundant life! A bad habit can be anything that you currently do that you wished you didn’t – watching too much TV, eating fast food, smoking, drinking alcohol, cursing…you name it. We do these things because they give us immediate gratification. However, you are reading this article because you desire abundance and fulfillment – not the immediate, fleeting satisfaction of a bad habit. In keeping with the common theme of the other things keeping you from abundance, bad habits weaken you. Bad habits actually have much in common with the scarcity mentality – thinking shortsightedly, being impulsive, making excuses, and narrowing your time frame. Whatever bad habit you may have, don’t judge yourself but instead take some positive action. Adopt some newer, healthier habits that make you truly happy and more in line with the life that you desire for yourself. There are numerous books on establishing good habits, including how good habits lead to an abundant mindset. There is no credible psychologist or psychiatrist that denies the negative effects of emotional trauma, including trapped emotions that remain in our subconscious. These emotions are harmful because they are inherently difficult to ignore…they continue to affect you, whether you realize it or not. Obviously, these emotions have a harmful effect on your psyche and make it difficult to lead a life of abundance and fulfillment. The good news is if you do indeed have some kind of unresolved emotional distress or trauma, there are many different ways that you can relieve yourself of this burden unfairly placed upon you. One practice that is gaining notoriety is EFT (Emotional Freedom Techniques) tapping. While technically considered an alternative and energy-based therapy, EFT is continuing to gain recognition within the science-driven medical community as a potentially effective practice for treating different kinds of emotional trauma. Serina Deen, Assistant Clinical Professor of Psychiatry at the University of California – San Francisco wrote an interesting article in Huffington Post titled “Tapping Away Trauma: ‘Emotional Freedom’ Techniques,” where she attests to the positive results of EFT testing on herself and her colleagues despite her initial skepticism. Also, in an academic study conducted by Ph.D-educated clinical psychologists titled “Neurophysiological Indicators of EFT Treatment of Post-Traumatic Stress,” patients who experienced PTSD (Post-traumatic Stress Disorder) as a result of a severe motor vehicle accident reported improvement immediately following EFT treatment. Several neurological tests were administered and evaluate pre- and post-treatment, with all data signifying marked improvement in brain function. We’ve discussed a few different things that may be keeping you from a mindset of abundance and fulfillment. Our hope is that you recognize the greatness that lies within and put some of these things that may apply to you into practice. After all, you deserve to live a life of abundance and fulfillment. Don’t let anything – even yourself – get in the way of what you aspire to become!